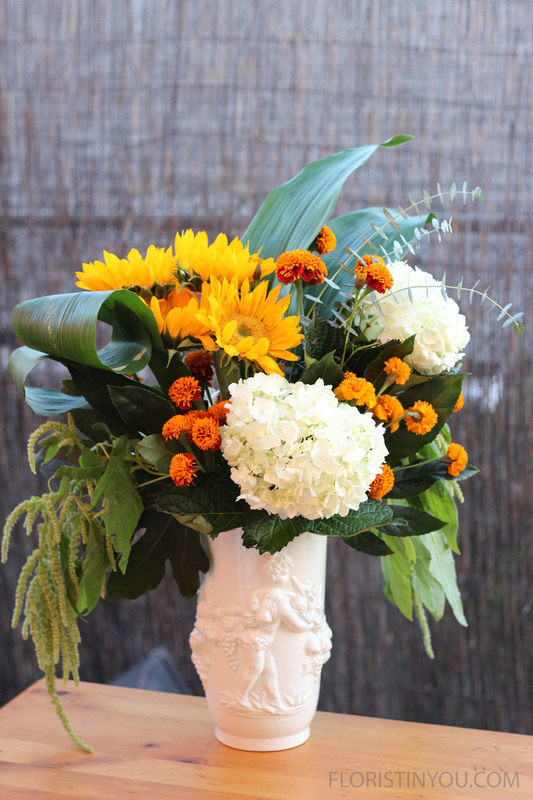 This is a large arrangement that stands 26 inches tall with the white of the vase and hydrangeas central to the arrangement. 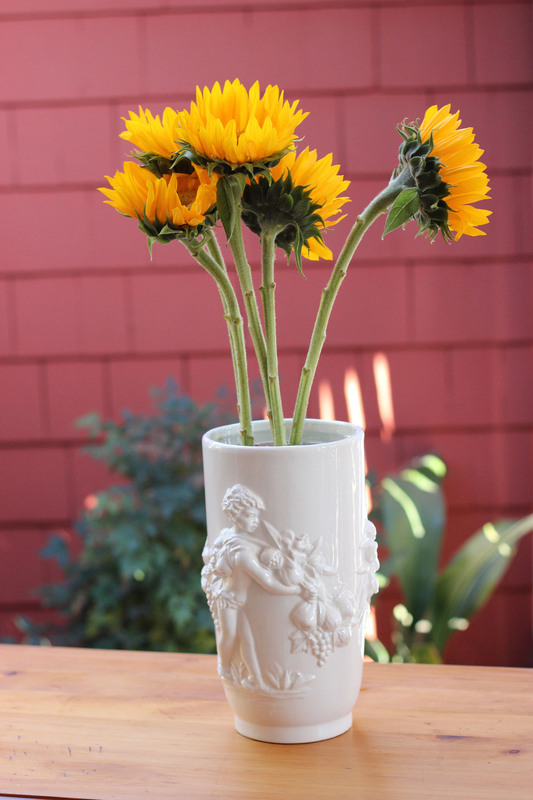 The vase, with its classical figures in relief, lend the arrangement an air of sophistication. 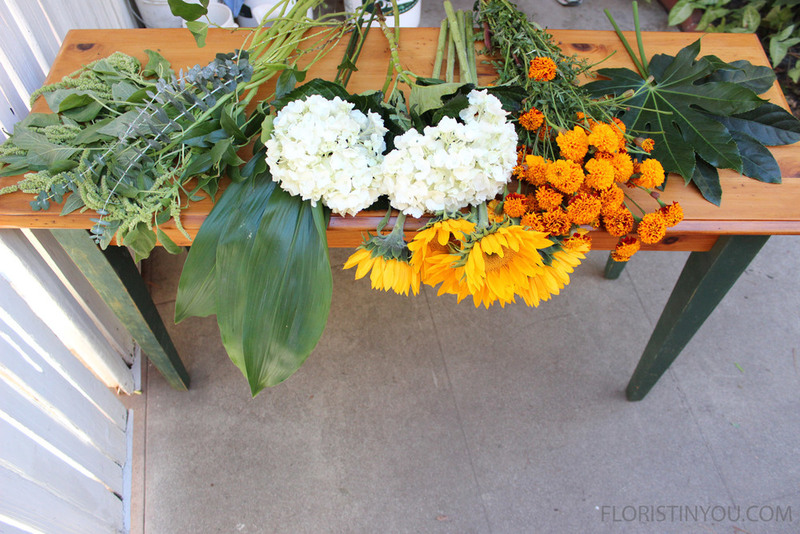 This is a fall-winter arrangement. 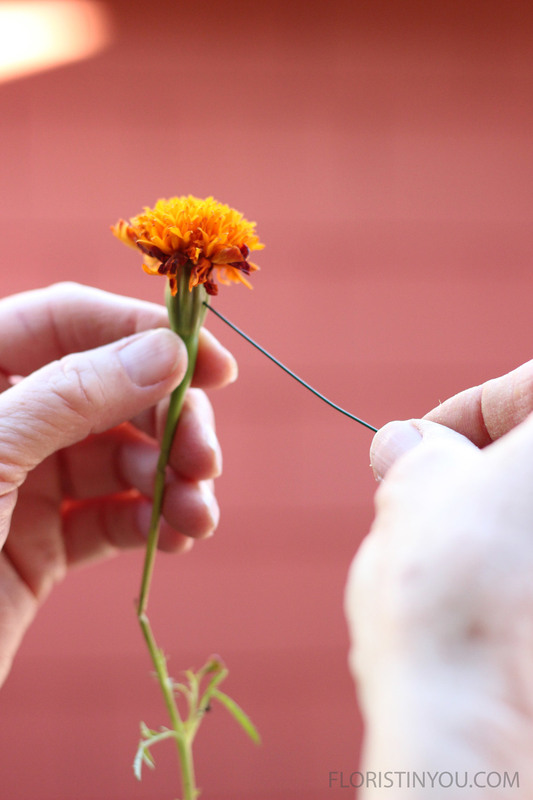 You will find the marigolds, technically calendulas, in the fall. The marigolds have several flower heads that come off the same stem and each flower has its own 4 inch trumpet shaped stem. They hang their heads down and are very pretty, but the little stems bend easily, so you will have to wire the heads that are bent. 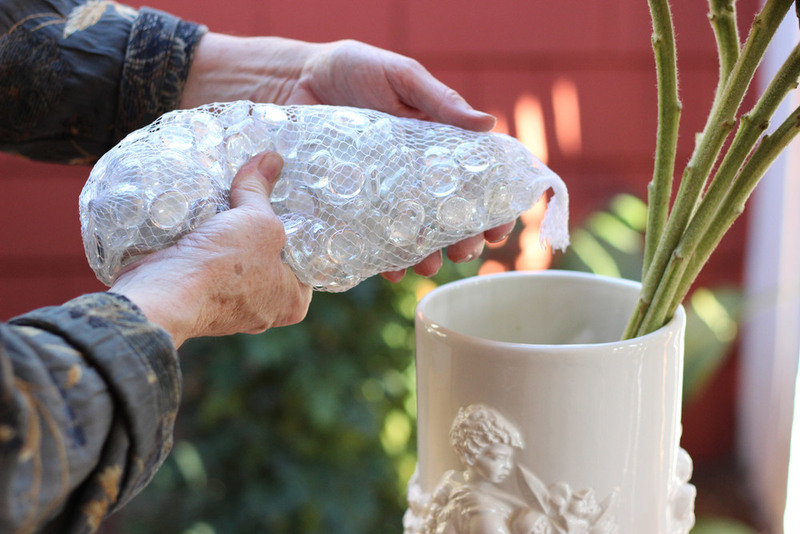 Since this vase has such a large opening, you will need to use marbles to hold the flower stems in place. The arrangement has a front, back, and two sides, which you construct as you go so that, just as in a sculpture, it is well proportioned on all sides. The top of this arrangement is asymmetrical while the bottom of it is symmetrical. The hydrangeas and the sunflowers form a triangle, with the lower hydrangea positioned at the lowest vertices or point of the triangle. The shaped tea leaves to the left balance the curved tea leaf and the 3 curved eucalyptus stems on the right. Then the hanging green amaranthus and the monster leaves on each side give the lower part of the arrangement perfect symmetry. By the way, you can grow tea leaves in your yard. Having them in your garden is great fun because you can cut a few leaves off when you need them. Okay, now that we've talked about triangles, asymmetry, and symmetry, let's get to work. Rounded tea leaves to the left, asymmetrically balance tea leaves and eucalyptus that curve right. Amaranthus and monster leaves are symmetrically balanced. If you have tea leaf plants growing in a shady part of your garden bed, cut 4 for this arrangement. If not you can get them at the flower mart. 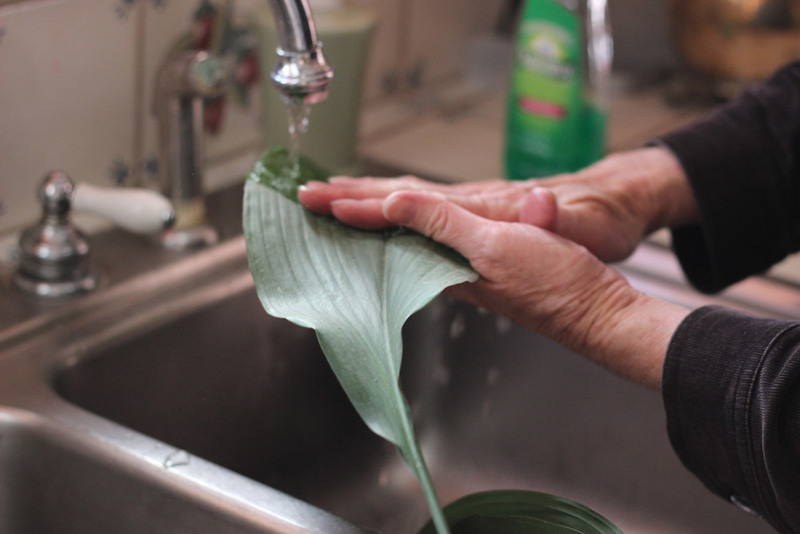 If you cut the tea leaves, wash each leaf. Dry leaf with towel, going from one end of leaf to the other. Snip tiny bit off stems. Keep in water until you use each one. Add water to vase. Leave 3 or 4 inches at top. Cut a tiny bit off the ends of the sunflower stems. 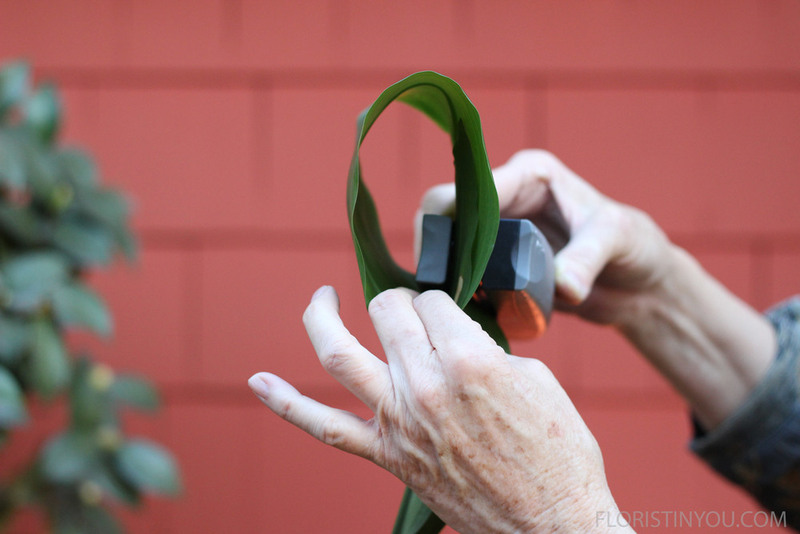 Do the same before using each flower or leaf. 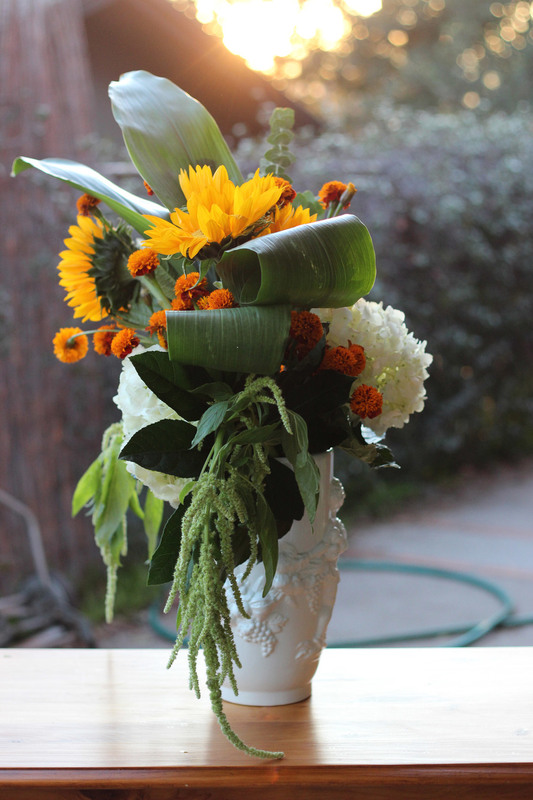 Put sunflowers in the vase and add 1 bag of floral marbles. Arrange stems in the marbles, so they are standing upright. Place most sunflowers on the left and one on the right.. 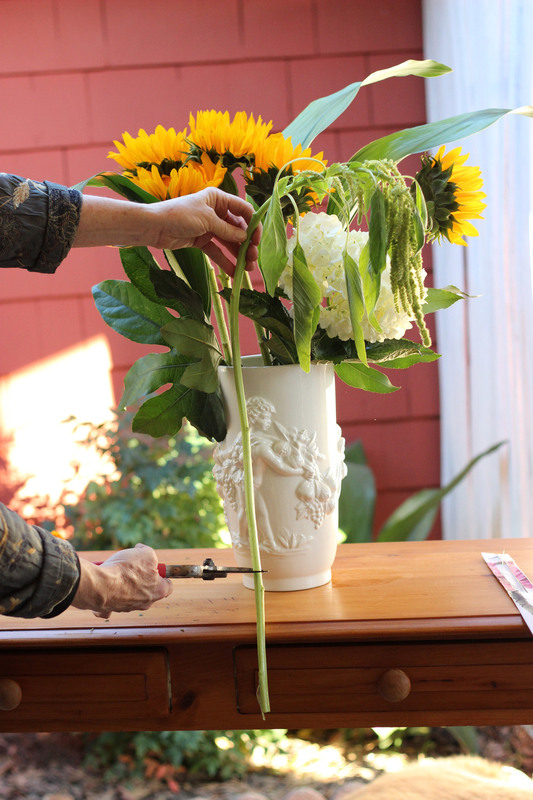 Hold hydrangea in front of vase and measure where to cut. Flower head should be a little above top of vase. 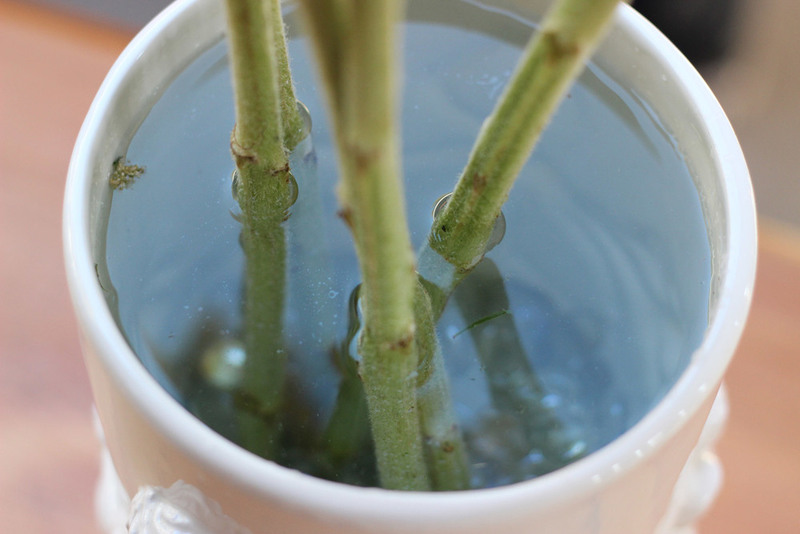 Snip a tiny bit off the bottoms of the tea leave stems. 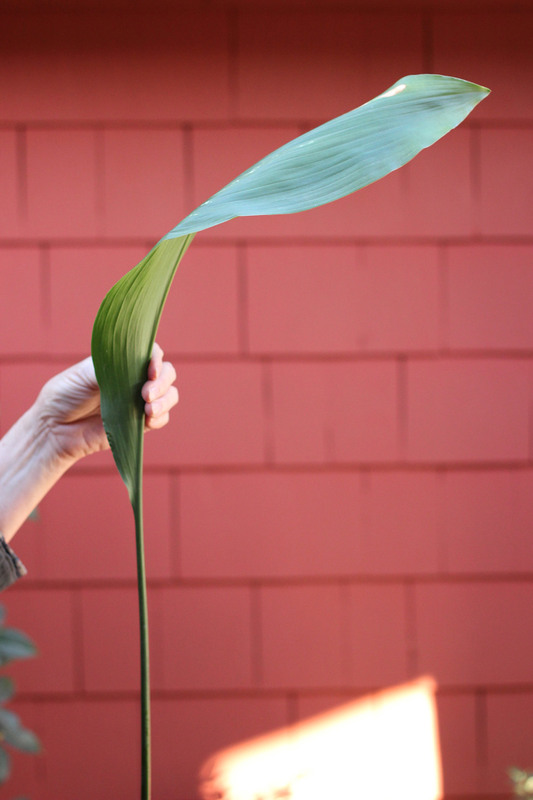 Roll the leaf down to make an oval. Staple vertically, line up with center vein. Make another 3 inches shorter. 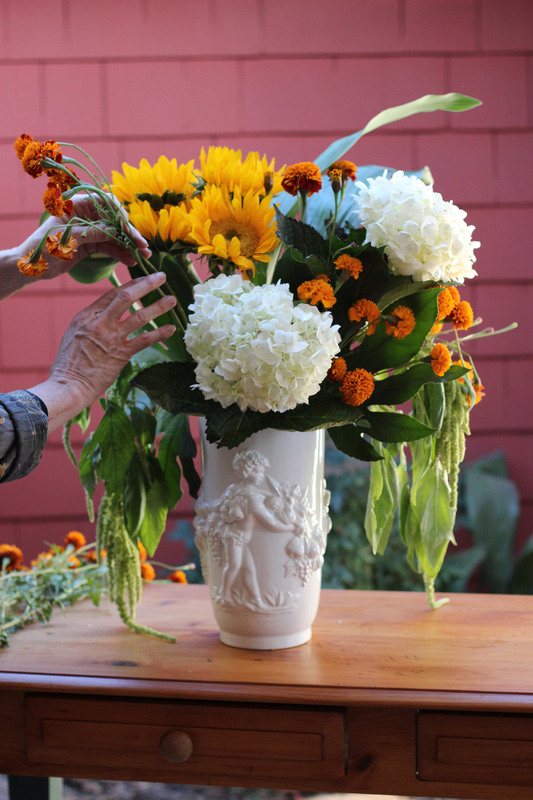 Trim a tiny bit off stem and place on both sides of vase. Put 2 remaining tea leaves on right, curving toward the right. Hold the amaranthus in front, measure and cut. Put a piece on both sides in the vase. Strip leaves below water level. 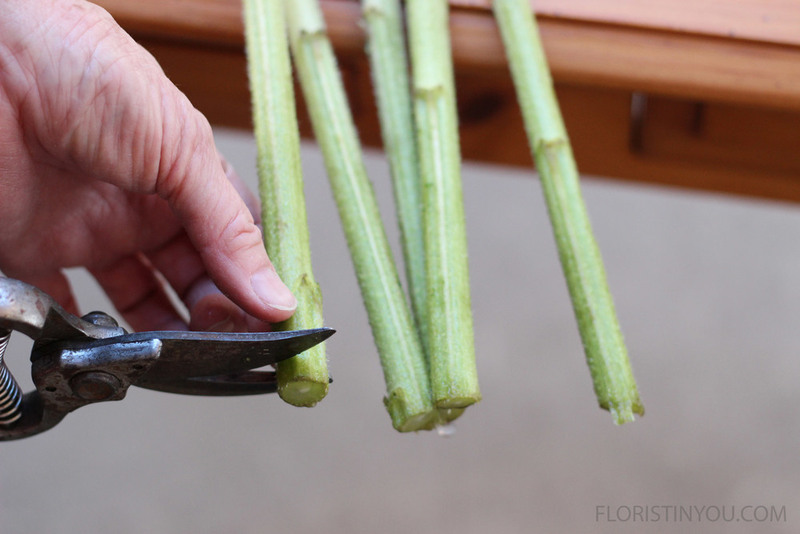 Clip off stems without a flower or with a broken head. These flower heads are heavy. Wire any that are bent. Take 1/3 piece of floral wire and insert the wire here. Bring wire down past bend, then wrap around stem. Add another hydrangea to the top right, the same height as the sunflowers. Carefully add the marigolds in on each side. You might have spectators. That's always more fun. 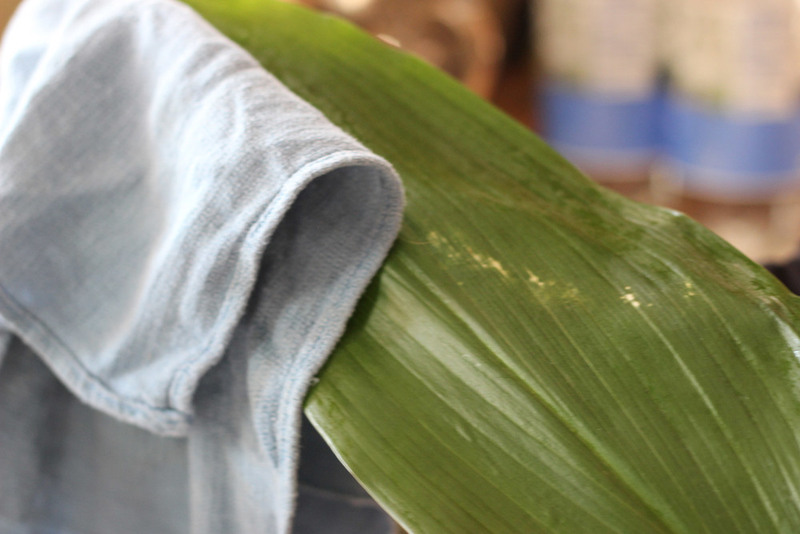 Measure and cut eucalyptus stems. Insert with curve to right. This arrangement has a definite front, back, right side, and left. This is how the left side will look. Now for the back...Trim the last 2 hydrangeas. They go low in the vase next to each other with marigolds above. This is the finished arrangement. It has an elegant fall look.